I'll be flying from Stockholm Arlanda Airport and my ticket doesn't include lounge access. What lounges accept payment for access at Arlanda Airport? I've found Arlanda Lounge and Menzies but not in which terminals they are neither how much they charge or what they offer. 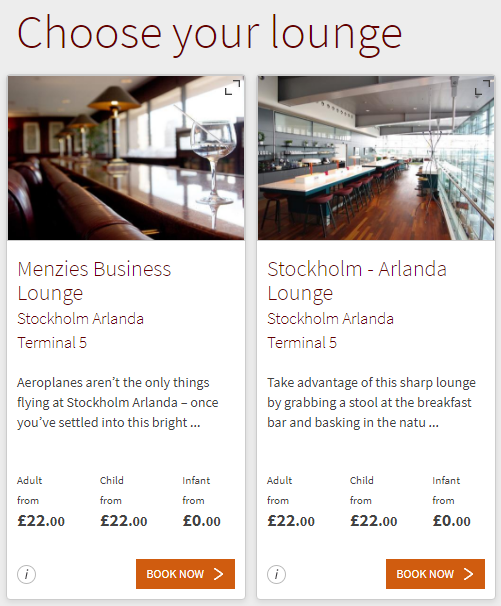 It states the two that you have mentioned as being the only pay-for lounges in ARN, both in Terminal 5, and when clicking through the 'buy a lounge pass' options, it comes out at 'from £22' for adult access. Not the answer you're looking for? Browse other questions tagged sweden lounges airport-terminals or ask your own question. Is there a business class lounge at Noumea Tontouta airport? Is there a lounge in the International side of Cairns airport?